A Registry is the database of all domain names registered under a certain TLD. A Registry Operator, also known as Network Information Center (NIC), refers to person(s) or entity(ies) responsible for providing registry services. These services include customer database administration, zone file publication, DNS and DNSSEC operation, marketing and policy determination. A Registry may outsource some, all, or none of these services. Different registries exist for different TLDs. The National Science Foundation signed a Cooperative Agreement with Network Solutions (NSI) as Registry Operator and Registrar for the .com, .net and .org TLDs from 1993-1999. The registry agreement was renewed by ICANN in November, 1999. Under the new agreement, NSI agreed to create a multiple registrar system also known as the Shared Registration System (SRS), which allows independent registrars to access the system. Independent registrars were to pay NSI $6.00 for every registered or renewed domain names. (b) Registry Operator Shall Not Act as Own Registrar. Registry Operator shall not act as a registrar with respect to the TLD. This shall not preclude Registry Operator from registering names within the TLD to itself through a request made to an ICANN-accredited registrar. (c) Restrictions on Acquisition of Ownership or Controlling Interest in Registrar. Registry Operator shall not acquire, directly or indirectly, control of, or a greater than fifteen percent ownership interest in, any ICANN-accredited registrar. At present, these provisions are included in the registry agreements for all sponsored and unsponsored TLDs. Some believe that vertical separation is one of the most important methods used by ICANN to maintain its commitment to promote competition, which is one of the founding principles of the organization. On March 12, 2002, the ICANN Board passed a resolution stating the organization's strong position for the implementation of "strict separation" of registries and registrars for new gTLDs. The ICANN Board also stated that co-ownership will be prohibited. However, the ICANN Board also indicated, "if a policy becomes available from the GNSO, and approved by the Board prior to the launch of the new gTLD program, that policy will be considered by the Board for adoption as part of the New gTLD Program." During a Special Meeting on Novemer 5, 2010, the ICANN Board changed its position regarding the vertical separation of registries and registrars. The Board removed the restriction on cross ownership on the Registry Agreements and replaced it with "requirements and restrictions on any inappropriate or abusive conduct arising out of registry-registrar cross ownership..." These abusive conducts are not limited to misuse of data and violations of a registry code of conduct. In addition, ICANN also stated that it will include additional enforcement mechanisms such as self-auditing requirements, contractual termination and punitive damages. Moreover, it also emphasized that "it will have the ability to refer issues to relevant competition authorities." None of the proposals submitted by the GNSO reflected a consensus opinion; as a result, the Board supported a model based on its own factual investigation, expert analysis, and concerns expressed by stakeholders and community. ICANN's position and mission must be focused on creating more competition as opposed to having rules that restrict competition and innovation. Preventing cross-ownership would create more exposure to ICANN of lawsuits, including anti-trust lawsuits, which are costly to defend even if ICANN believes (as it does) that it has no proper exposure to such litigation. Rules permitting cross-ownership enhance efficiency and almost certainly will result in benefits to consumers in the form of lower prices and enhanced services. Case by case re-negotiation of existing contracts to reflect the new cross ownership rules will permit ICANN to address the risk of abuse of market power contractually. In the event ICANN has competition concerns, ICANN will have the ability to to refer those concerns to relevant antitrust authorities. Vertical separation provides a balanced playing field for competition between registrars. The absence of expert advice to remove vertical separation and stakeholders consensus shows that the move may be premature and might result in negative market output for consumers. Vertical Integration might harm competition. The European Commission cited the CRA International Report of 2008, which emphasized the risk of vertical integration wherein registries may discriminate independent registrars by lowering prices and providing better registry services to their affiliate registrars. ICANN does not have sufficient data to support the full removal of vertical separation. A consensus on the issue within the GNSO and internet stakeholders is lacking. The procedural approach of ICANN to refer an application to relevant antitrust authorities for "expert analysis and ante determination" overlooks the fact that competition authorities have limited powers in implementing rules, which is based on a case to case market analysis. ICANN did not clearly identify specific laws that will serve as basis of its jurisdiction to determine if there are concerns regarding competition. Referral to competition authorities depends on ICANN's discretion. Conduct independent economic and legal expert studies regarding the present situation of the domain name market and evaluate the impact of the existing restrictions on vertical integration. The impact of partially or totally removing the restriction on innovation and to consumers. Provide new market data on the current degree of competition and cross-ownership at the registry and registrar level. 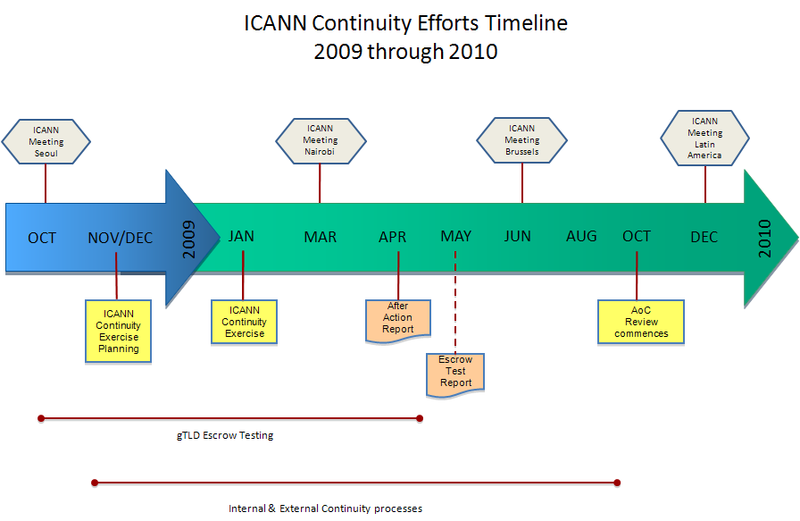 Provide data and documents supporting ICANN's decision to fully remove vertical separation. Provide comments regarding the procedural concerns raised by EC. In connection with the implementation of new gTLDs, ICANN designed a new program known as Emergency Back-up Registry Operators (EBEROs) to ensure the safety and security of the domain name system. EBEROs are to be activated in circumstances wherein a new registry operator needs help to maintain critical functions for a period or time or during transition from one registry operator to another. A Request for Proposal (RFP) was issued by ICANN to solicit applications from entities interested to serve as EBEROs on September 14, 2011. Maintain and develop the operational stability, reliability, security, and global interoperability of the Internet. Apply documented policies neutrally, objectively with integrity and fairness in decision making. Be responsive and speedy in taking actions to resolve the needs of the Internet community and obtain informed input from affected entities during the decision making process. This page was last edited on 7 March 2017, at 18:56.